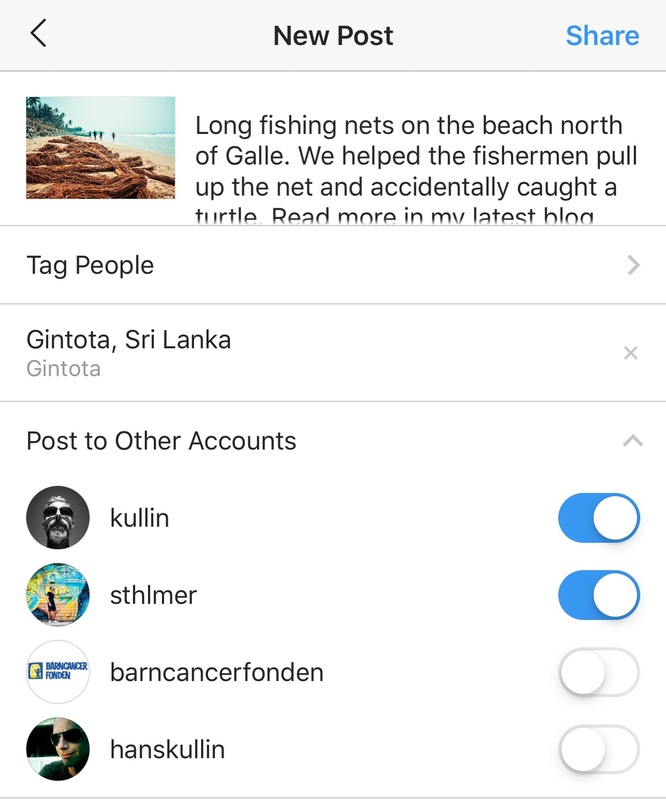 Today I noticed a new feature on Instagram. 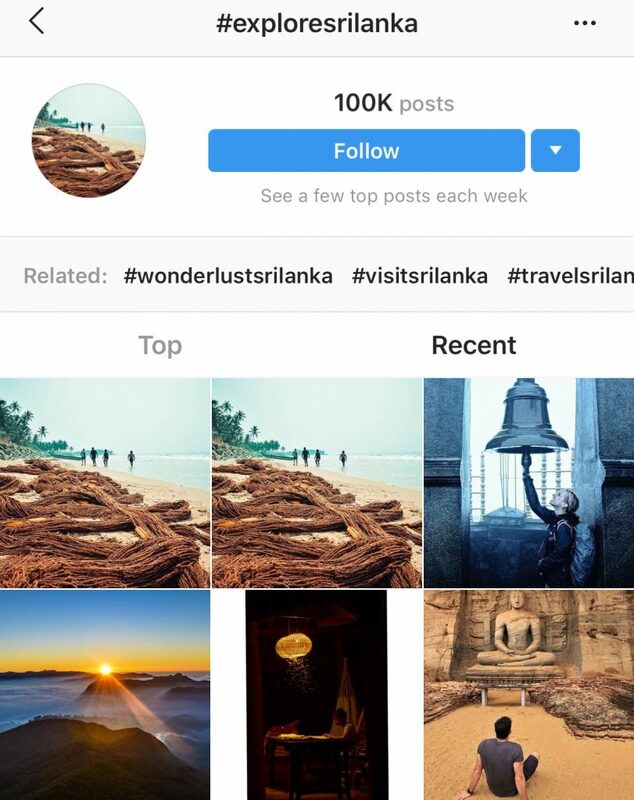 If you are logged in to more than one account, Instagram now lets you post the same image or video to multiple accounts at the same time. With this new feature there are toggle switches for each account that you are logged into. By turning the switch on or off, you can decide which accounts the image or video will be posted to. I tried to post to two of my accounts and it worked like a charm. This can be an advantage for users who run multiple accounts in the same niche, or for brands that may want to publish identical posts to different brand accounts. I would still use it with caution, especially if a lot of your views comes froms hastags. Since both images are publishes simoultaneously, they will appear next to each other in the hashtag feed, which may lower your reach and cause confusion. Anyway, it’s an interesting new feature and we will see if this is a limited test or if the feature is permanent. 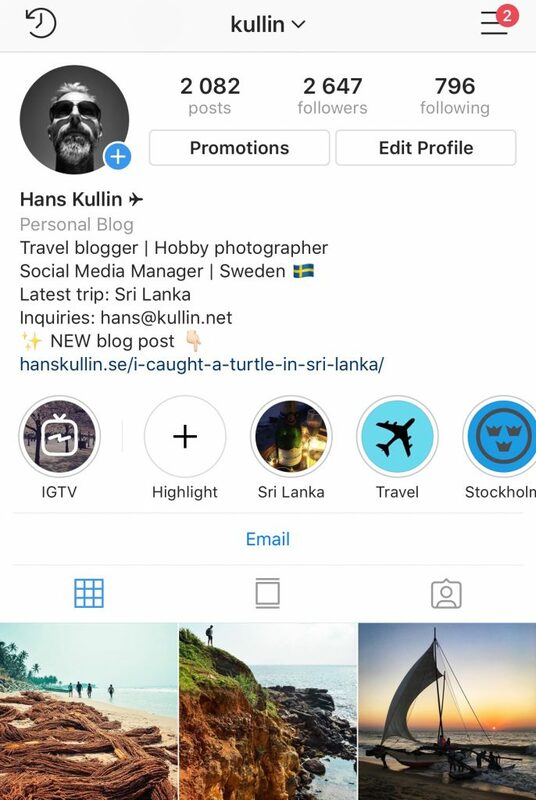 Follow me on Instagram at @kullin or @sthlmer for travel photography. Also see my travel blog “The World is Kullin”. The fight for the spot as the world’s most subscribed Youtube channel has been going on for about one month now. Swedish Youtuber PewDiePie has had the largest channel in terms of subscribers for quite some time, but he is challenged by the Indian music channel T-Series. I wrote about a year ago that T-Series already was the largest channel on Youtube in terms of number of views. T-Series overtook the Swede already back in February 2017 and now has 53.5 billion views, compared to 19.2 billion for the Swedish gamer. According to the trend in October this year, T-Series should have passed PewDiePie already a month ago, but since this became a “thing”, PewDiePie’s numbers have improved significantly and he is now adding more new subscribers per day than he has done at any point during the last two years. So he has benefited a lot from the competition from T-Series. T-Series is still growing slightly faster (about 35k more per day) and at the current speed, T-Series will overtake PewDiePie as the world’s most subscribed Youtube channel on Saturday, Nov 24. IKEA today opens up its first India store in Hyderabad City. The Swedish furniture retail giant continues to be ranked the most valuable Swedish brand according to an annual survey by the brand valuation and strategy consultancy Brand Finance. In a new report listing the top 50 brands in Sweden, IKEA holds the number 1 position in terms of brand value, followed by H&M and Nordea. The top 10 list remains intact from 2017 but there are significant changes in value among the leading brands. For example, Nordea is the only brand among the top 6 that actually sees an increase in value, up 7% according to the metrics used in the report. Among the losers on the list is for example forestry and paper giant SCA which drops from number 18 to 38, with an estimated drop in brand value of 86%. The highest new entry on top 50 is hygiene and health company Essity which enters the list at number 20. The explanation for this dramatic shift (which the report fails to mention) is of course that SCA in 2017 split its business into two different brands: SCA and Essity. The fastest growing brand is the e-casino B2B provider Evolution Gaming which increased its value by 82%. 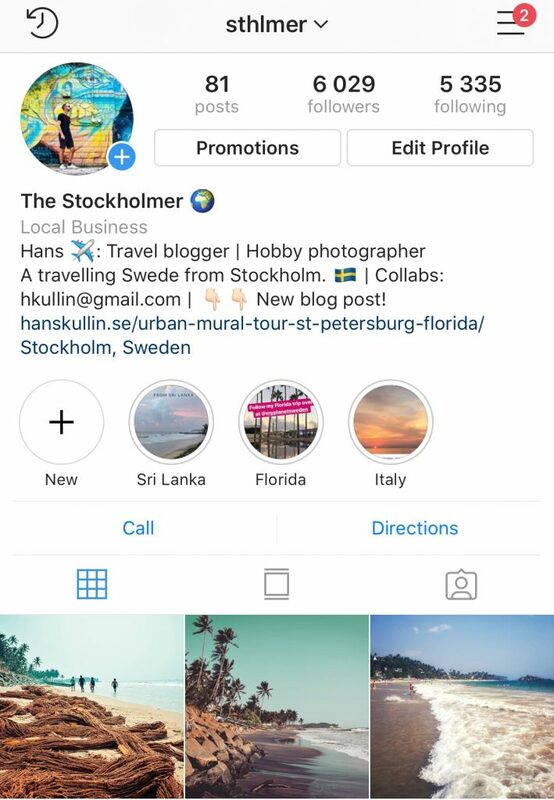 For travel tips about Sweden, check out my travel blog. The group stage at the FIFA World Cup 2018 in Russia is now over and tomorrow the round of 16 knockout stage will begin. Based on the current FIFA ranking, one half of this stage looks a lot more difficult than the other due to several top ranked teams being place on the same side. On one side you have four of the five highest ranked football teams: Brazil (2), Belgium (3), Portugal (4), Argentina (5) and France (7). Also on this half are Uruguay (14), Mexico (15) and outsider Japan (61). 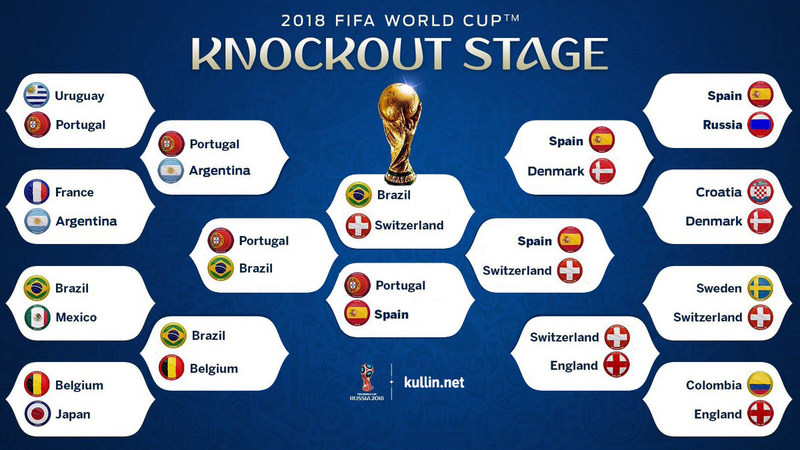 The somewhat “easier” half of the knock out stage includes Switzerland as the highest ranked nation (6), along with Spain (10), Denmark (12), England (also 12), Colombia (16), Croatia (20), Sweden (24) and host nation Russia (70). Fortunately, lower ranked teams of course can beat higher ranked teams, like Mexico’s surprise win over first ranked Germany. But as a fun exercise, here are the predictions for the Round of 16 based on current FIFA ranking. World Champions will be Brazil as they beat Switzerland in the final. Bronze goes to Portugal as they beat Spain. Starting tomorrow, we will know which teams will advance and possibly make it all the way to the World Cup Final. Digital influencers have become a major force in online marketing in recent years. Brands turn to celebrities and other influencers to engage audiences and sway purchase decisions in influencer marketing campaigns. A new study by Fullscreen and Shareablee shows that these social media influencers have a strong impact on their followers’ behaviour. In the study, consumers aged 18-34 were asked whether they had taken any action as a result of seeing social media posts from digital influencers. Not surprising, many of them had and it turned out that celebrities were least effective in swaying consumer behaviour. Micro influencers and “rising stars” are most effective in getting consumers to try one of their recommendations. As many as 45% of consumers report that they had done that. “Digital trailblazers” are very effective at getting followers to purchase an item that they talked about in social media. 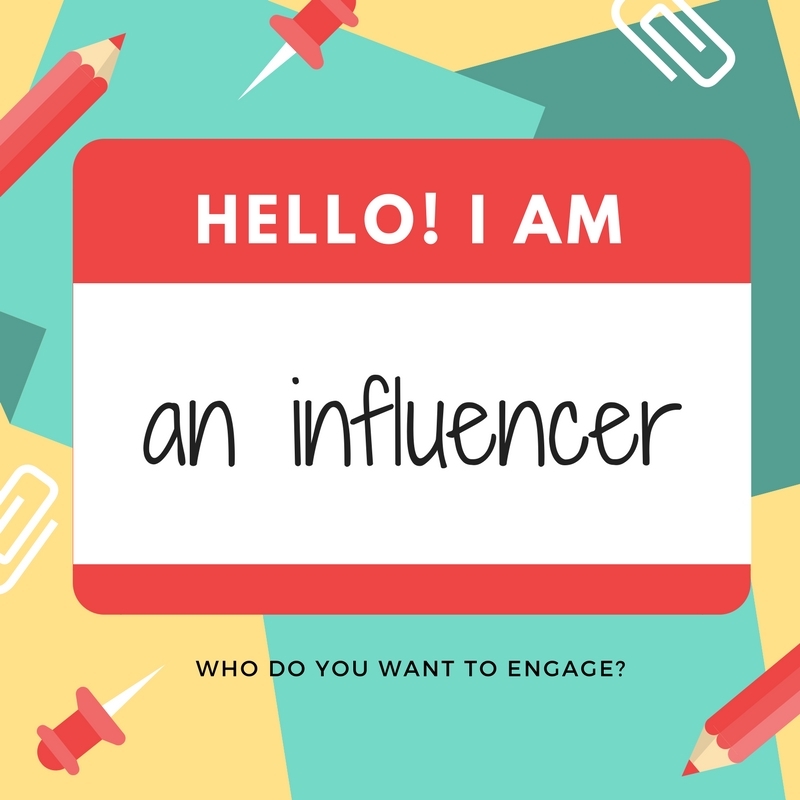 Influencers with less than a million followers are almost as effective, while one in five consumers report that they had made a purchase as a result of a celebrity post. 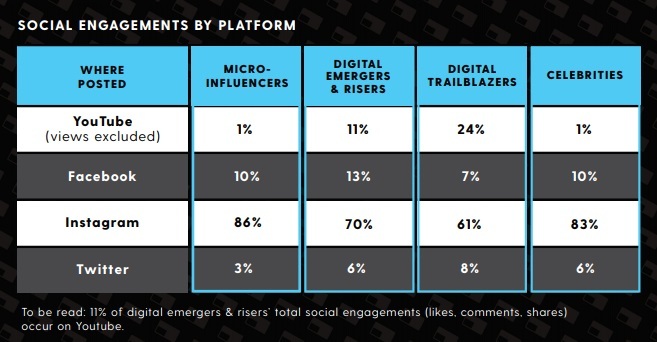 Among the social platforms that digital influencers use (Snapchat not included), Instagram creates the most engagement. This is especially true for micro influencers who see 86% of total engagement take place on Instagram. That doesn’t mean, of course, that for example Youtube is not important. For many influencers, Youtube generates millions of views, so it all depends on how you define engagement. Also, I would have liked to see how much blogs affect consumer behaviour. At least in Sweden, many high profile bloggers generate massive sales for brands in campaigns that include a combination of blogs, Instagram and Youtube. 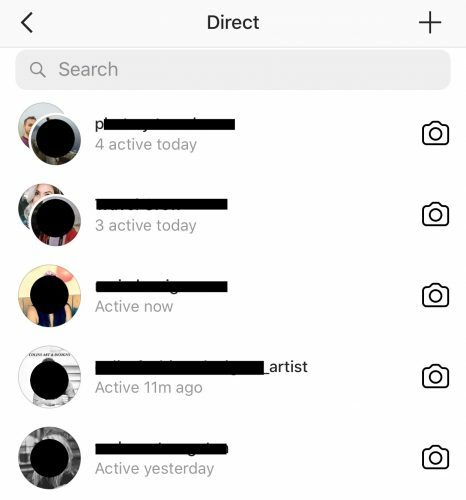 Instagram now shows you when your contacts were last active on the app. If you look under the direct messages, it states how many minutes, hours or days since the other users were last active. That of course means that they can see your status as well. If you find this intrusive, fear not, there is a way to shut it off. Here’s how to do it. Go to your profile and click on the settings gearwheel. Scroll down to Show Activity Status and slide to turn it off. 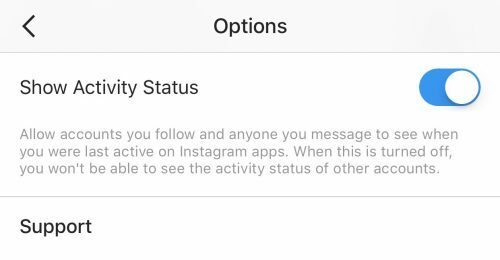 Once you remove this feature, you will not be able to see others’ status and they will not see yours.